Plaque in memory of Michel Simon, 27 Grand Rue, Geneva. Michel Simon (French: [simɔ̃]; 9 April 1895 – 30 May 1975) was a Swiss actor. 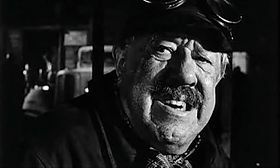 He appeared in the notable films La Chienne (1931), Boudu Saved from Drowning (1932), L'Atalante (1934), Port of Shadows (1938), The Head (1959), and The Train (1964). The actor François Simon is his son. Simon used to say about himself that he was born in 1895 and, "as misfortune never comes singly, cinema was born the same year". Son of a Catholic sausage maker and a Protestant housewife mother, Simon soon left his family and town to go to Paris, where he first lived at the Hotel Renaissance, Saint-Martin Street, then in Montmartre. He worked many different jobs to survive, such as giving boxing lessons or peddling smuggled lighters. He devoured every book he could find, with special preference for Georges Courteline's writings. His artistic beginnings in 1912 were modest: magician, clown and acrobat stooge in a dancers' show called "Ribert's and Simon's", in the Montreuil-sous-Bois Casino. Conscripted into the Swiss Army in 1914, he described himself as insubordinate, spending a lot of time in the stockade. He also contracted tuberculosis. In 1915, while on leave, he saw Georges Pitoëff's early work in the French language, at the Theatre de la Comédie of Geneva, acting in Hedda Gabler. He then decided to become an actor too, but had to wait until 1920 before making his first brief appearance on stage, with Pitoëff's company, speaking three lines for the registrar role in the Shakespeare's Measure for Measure. He also worked at this time as the company's photographer. He was spotted for the first time in a supporting role in George Bernard Shaw's Androcles and the Lion. In 1922, his company moved to Paris at the Comédie des Champs-Élysées. He quit the following year to become a light comedy actor in plays by Tristan Bernard, Marcel Achard and Yves Mirande. Marcel Achard presented him to Charles Dullin, in whose company he acted in Je ne vous aime pas with Valentine Tessier. Louis Jouvet, who had meanwhile replaced Pitoëff, hired him at the Comédie des Champs-Élysées. Simon then gave a successful performance in Jean de la Lune, a play by Marcel Achard. His inimitable talent transformed his Cloclo supporting role to the big attraction of the play. His theatrical career then blossomed with a large repertoire: Shakespeare, Bernard Shaw, Pirandello, Oscar Wilde, Bourdet, Henri Bernstein, but it was film that brought him stardom. His first film appearance was Feu Mathias Pascal, adapted from Pirandello and directed by Marcel L'Herbier. Very soon after, he appeared in La vocation d'André Carel, directed by Jean Choux. The film used small-scale production methods, just as the Nouvelle Vague would do. In silent movies, he brought his amazing appearance and his unusual face – a talent with an exceptional mobility, but without mannerism. He exploited his body, especially his ugliness, offering a very wide range of characterisations that brought audience sympathy, as in Boudu sauvé des eaux, or sometimes, In Quai des brumes for example, disdain. His film career was boosted with the advent of talking pictures. People remarked that his elocution and gravelly voice were as original as his appearance and play. He then revealed his unclassifiable talent: action comedy, drama, tragedy, light comedy. He appeared in 55 plays from 1920 to 1965, and 101 from 1965 to 1975. He appeared in Dreyer's 1928 The Passion of Joan of Arc. He acted in films for Jean Renoir (La Chienne, Boudu Saved From Drowning), Jean Vigo (L'Atalante) and Marcel Carné (Port of the Shadows, Bizarre, Bizarre). In the 1950s, he reined in his activities following an accident involving a makeup dye that left part of his face and body paralysed. In 1967, he won the Silver Bear for Best Actor at the 17th Berlin International Film Festival for his role in Le vieil homme et l'enfant (The Two of Us). He died at 80 years of age from a pulmonary embolism and is buried in the Grand-Lancy Cemetery of Geneva, next to his parents, as per his testamentary wishes. In the 1920s/1930s, Simon enjoyed associating with the Parisian lower classes. Simon would say that he preferred "living with animals than humans". He lived for a long time in a kind of bohemian house in Noisy-le-Grand, near Paris. He built a series of exterior wire tunnels that linked the various floors and allowed his pet monkeys freedom to roam around. The house was surrounded by rank weeds, and filled with amazing bric-a-brac, including his large collection of erotica, including photographs and films. This collection was dispersed after his death. ^ "Berlinale 1967: Prize Winners". berlinale.de. Retrieved 17 February 2010. ^ Plume/Pasquini, Christian/Xavier (1981). Michel Simon. Edition Alain Lefeuvre. pp. 44–45. ISBN 2-902639-68-6. Wikimedia Commons has media related to Michel Simon.